Entry period has passed. Winner will be randomly drawn tonight! 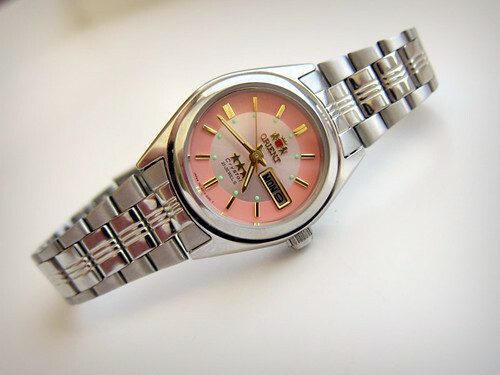 As I said in my Orient Watch USA video review, I am always late, but I've been trying to change that thanks to the help of my pink faced automatic watch courtesy of Orient USA Watch. Orient Watch USA has been big in the blog world lately. Hubs is in dire need of a new watch, and though they are most well known for their men's line (like the CEZ05001B and the CEV09001W) they also have some fine women's watches, as well! 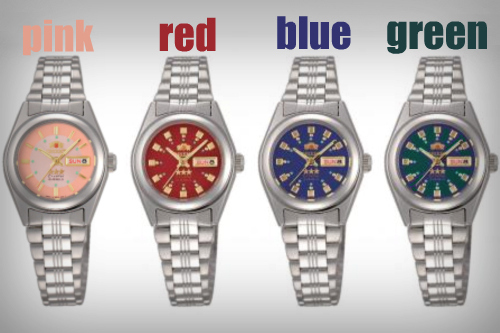 In fact, you can win one of these watches this week on Adored Austin! I can't promise that you'll never be late again, but I can promise that you're wrist will look good adorned with one of these watches! Isn't my watch cute? I have the pink faced watch. But if you win, you can choose between a pink face, red face, blue face, or green face. 1. Double check to make sure you're following Adored Austin either on Google Reader, Blog Lovin', Networked Blogs (fb app), or simply like Adored Austin on Facebook. Update: form removed. Entry period passed. Good luck, everyone! I'll draw the winner at random on Monday night, August 16th. No need to retweet or repost or any of that madness for extra entries. Please, only one entry per person. *note: After the winner has been announced, I delete all your information from my inbox and server to ensure your privacy. I never share your email address with others without your permission.